LOW AND SLOW UNTIL IT’S GOOD AND READY. Karl Hartkemeyer (center), owns Karl’s Bar-B-Q Express in Chippewa Falls. 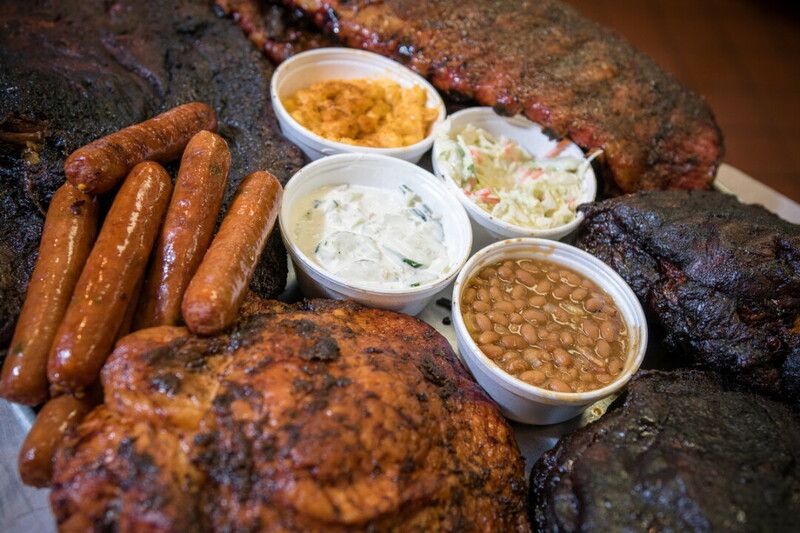 The menu features brisket, ribs, and turkey – and chicken’s on the way. Karl Hartkemeyer isn’t just a barbecue chef; he’s a barbecue artist. While attending school for engineering, he became a restaurant cook to pay for his schooling. Hartkemeyer honed his culinary skills working at Houligans and Fanny Hill. Eventually he became the owner of the Embers restaurants, including The Fireside in Eau Claire. A year after opening that restaurant, a fire destroyed everything. Rising from the ashes of that disaster was Bar-B-Q Express. Bar-B-Q Express made a name for itself catering weddings, corporate events, and other celebrations, but Hartkemeyer missed the restaurant. In 2011, he moved into The Eagles Club in Lake Hallie. He now caters from that location. In addition, his full-menu restaurant at 1456 Kennedy Rd is open daily from 11-2 and 5-9. Friday night is the famous fish fry, while Sunday morning features a breakfast buffet. “We have the best barbecue in the area. We’ve just learned to do it right.” Cooking is not a career for Hartkemeyer; it’s a lifestyle. Barbecue cooking appealed to him because it is an inherently American specialty. Hartkemeyer traveled to Texas to purchase his first smoker and found his grills in Detroit. Along the way, he tried a lot of barbecue joints, fine-tuning the taste he wanted for his recipes. Traditionally, barbecue woods were determined by geographical location. Texans tended to use mesquite while Georgians used pecan. Hickory was dominant in the Midwest, but the availability of flavors from all over the country now allows a chef to experiment in the blending of woods. Hartkemeyer tends to use hickory, maple, and cherry. Hickory is a strong-flavored wood with a sweet, smoky taste. The cherry adds a bit of smooth and subtle fruit flavor, while maple delivers a mild sweet taste. Hartkemeyer had a smoker made in Oklahoma for the new restaurant. 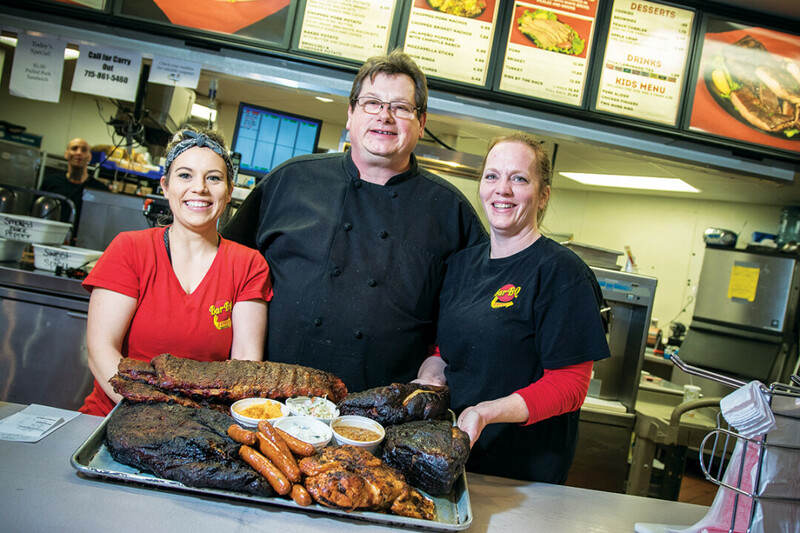 The pellet smoker can cook 500 pounds of meat daily at the new Chippewa location. Every morning at 5 am Hartkemeyer begins his day cooking at his new restaurant. Moving back and forth between The Eagles Club and Karl’s Bar-B-Q Express, he expertly oversees the daily supply of food for the restaurants and any catering needs. Currently, brisket, ribs, and turkey are featured at the new restaurant. Beginning in spring with the nice weather, chicken will be added to the menu as well. Because everything is made fresh daily, you may want to call ahead and place your order. For more information about the restaurant and its menu, visit karlsbbqexpress.com. Volume One's guide to the past, present, and future of this riverside city.